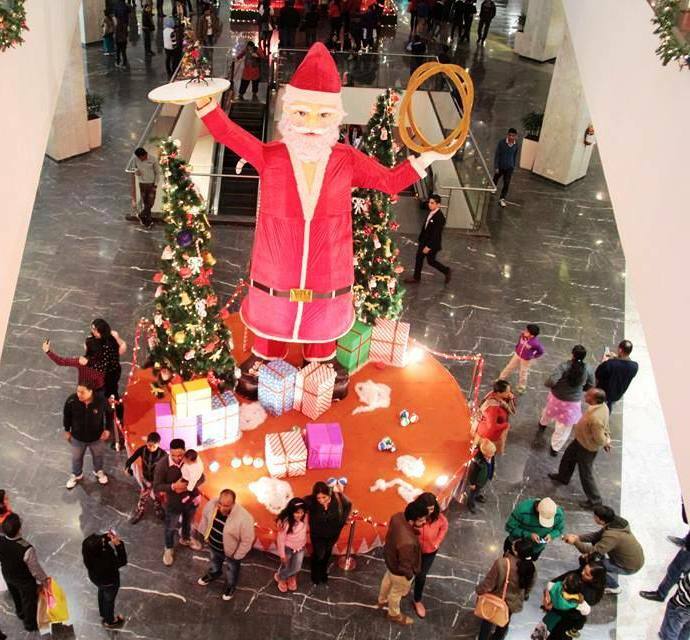 As year 2015 comes to an end with Christmas around the corner, Elante Mall in Chandigarh has been completely decked up for the festival. Being one of the largest mall in North India, Elante receives huge footfall as Chandigarh residents as well as those visiting the city as a tourist love spending their time over here. The crowd at Elante is almost double on the weekends and during festive days, it gets tripled or even more. 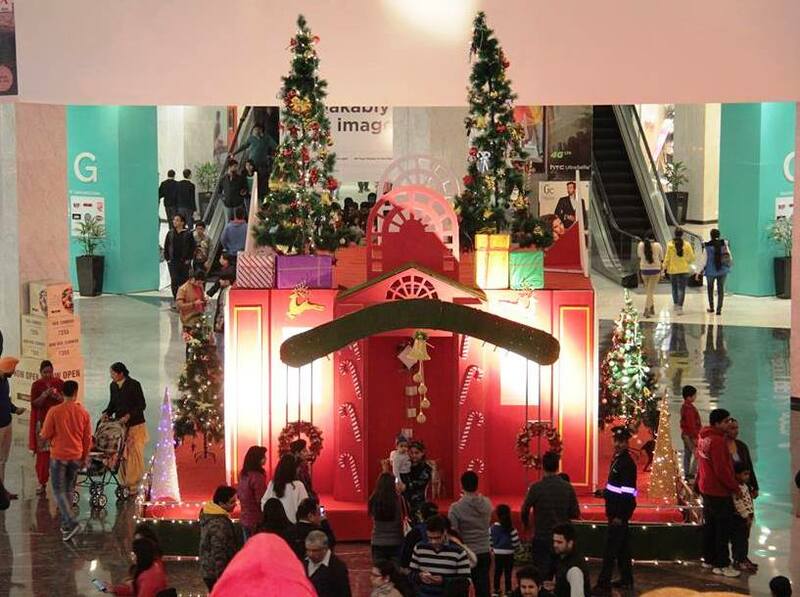 As it’s Christmas time, Elante Mall, Chandigarh has been beautifully decorated. 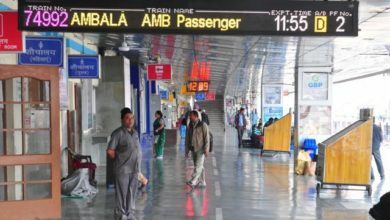 The entrance area, main courtyard, stage on ground floor are surely a delight to the eye. Here are some pics showing how Elante has been decorated for Christmas 2015. 6 Reindeer have been placed outside the main mall entrance. These have been lighted up to give an amazing view at night. 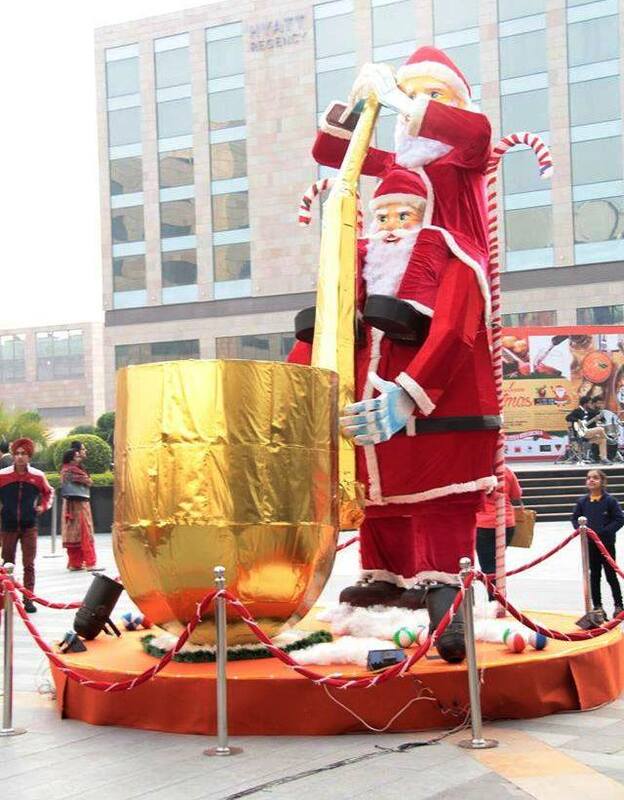 You’ll find a big Santa Claus with another one sitting on his shoulders with a golden trumpet in the courtyard area. There’s another Santa Claus inside Elante Mall on the ground floor. This one has been set up on a round platform which also has 2 Christmas trees and gift packs. Another place near the escalators which appears to be Santa’s home. 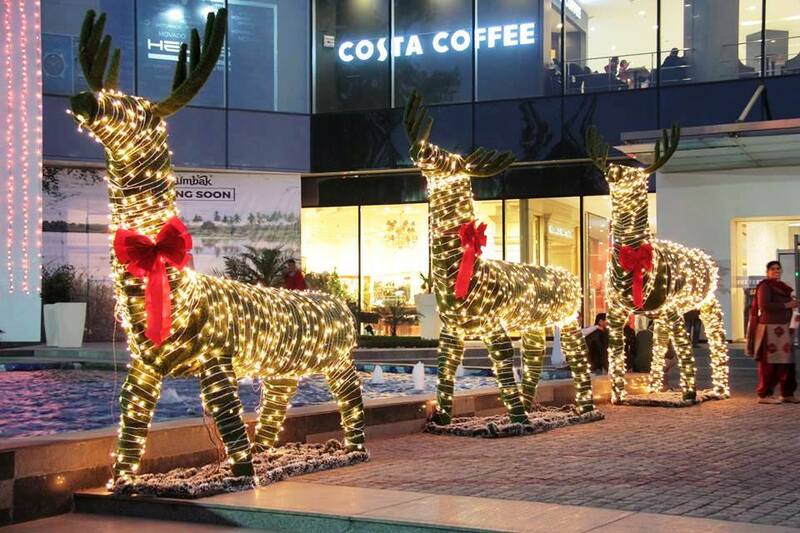 And here’s a closer look at the Christmas Reindeer outside Elante Mall in Chandigarh. 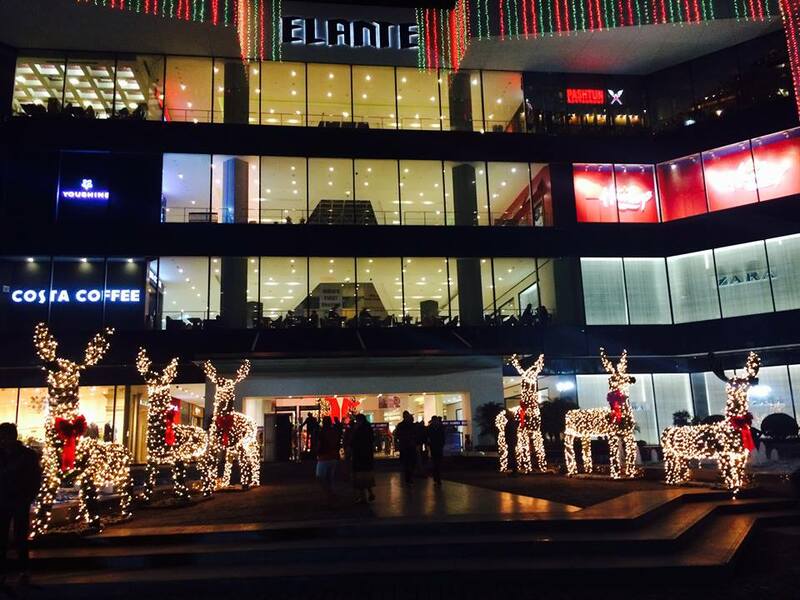 The best time to visit Elante Mall during Christmas days in Chandigarh is surely the evening time. 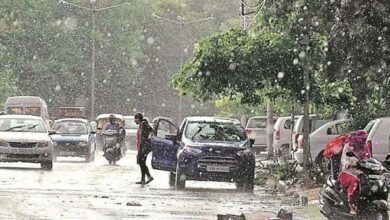 But be prepared, there’s huge rush. Here are some events that will take place at Elante as a part of Christmas celebration in the mall for year 2015. Santa Parade : 25th December 2015. 5 to 6 PM and 8 to 9 PM. Carol Singing : 23rd, 24th and 25th December. 5 to 7:30 PM. 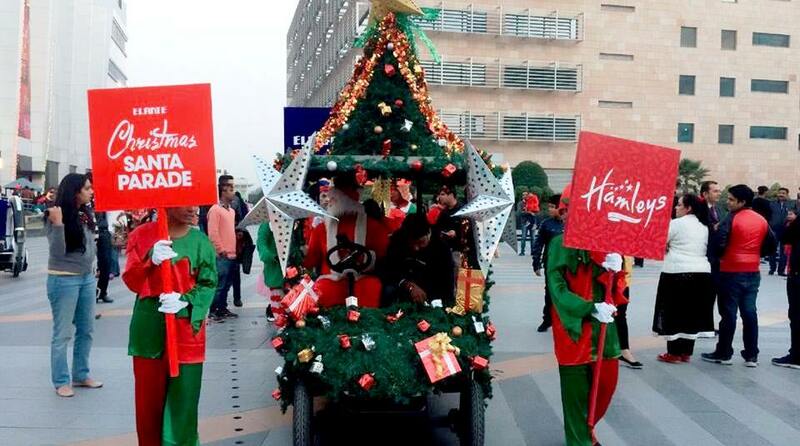 Do visit Elante during your Christmas Vacations and enjoy the festival of Christmas to the fullest in Chandigarh. P.S. The images have been taken from the Official Facebook Page of Elante Mall but have been edited and collected in a collage by Ajay Deep.